Sir Michael Terence "Terry" Wogan, KBE DL (born 3 August 1938) is an Irish radio and television broadcaster who has worked for the BBC in the United Kingdom for most of his career. Before he retired from his weekday breakfast programme Wake Up to Wogan on BBC Radio 2 in 2009, it had eight million regular listeners, making him the most listened-to radio broadcaster in Europe. Wogan began his career at Raidió Teilifís Éireann where he presented shows such as Jackpot in the 1960s. Wogan has been a leading media personality in the UK since the late 1960s and is often referred to as a "national treasure". He is known in the United Kingdom for his BBC One chat show Wogan, presenting Children in Need, Wake Up to Wogan, the game show Blankety Blank and Come Dancing and as the BBC's commentator for the Eurovision Song Contest from 1971 to 2008. Wogan currently presents a two-hour Sunday morning show, Weekend Wogan, on BBC Radio 2. 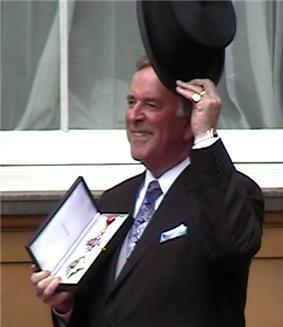 Wogan was granted an honorary knighthood as an Irish citizen in 2005. Wogan, the son of the manager of Leverett and Fry a high class grocery store in Limerick, was educated at Crescent College, a Jesuit school, from the age of eight. He experienced a strongly religious upbringing, later commenting that "There were hundreds of churches, all these missions breathing fire and brimstone, telling you how easy it was to sin, how you'd be in hell. We were brainwashed into believing." Despite this, he has often expressed his fondness for the city of his birth, commenting on one occasion that "Limerick never left me, whatever it is, my identity is Limerick." At the age of 15, after his father was promoted to general manager, Wogan moved to Dublin with his family. While living in Dublin, he attended Crescent College's sister school, Belvedere College. He participated in amateur dramatics and discovered a love of rock and roll. After leaving Belvedere in 1956, Wogan had a brief career in the banking profession, joining the Royal Bank of Ireland. While in his twenties, he joined the national broadcaster of Ireland, RTÉ (Raidió Teilifís Éireann) as a newsreader and announcer, after seeing an advert in a newspaper advertising announcer positions. Wogan conducted interviews and presented documentary features during his first two years at Raidió Teilifís Éireann, before moving to the light entertainment department as a disc jockey and host of TV quiz and variety shows such as Jackpot, a top rated quiz show on RTÉ in the 1960s. When the show was dropped by RTÉ TV in 1967, Wogan approached the BBC for extra work. He began working for BBC Radio, initially 'down the line' from London, first broadcasting on the Light Programme on Tuesday 27 September 1966. He presented the Tuesday edition of Late Night Extra for two years on BBC Radio 1, commuting weekly from Dublin to London. After covering Jimmy Young's mid-morning show throughout July 1969, he was offered a regular afternoon slot between 3 and 5. In January 1993, he returned to BBC Radio 2 to present the breakfast show, then called Wake Up to Wogan. His tendency to go off on rambling, esoteric tangents, often including banter with his then producer, Paul Walters, seems to have become popular with both younger and older listeners. The show was highly interactive with much of the entertainment coming from letters and emails sent in by listeners (many of whom adopt punning pseudonyms, such as Edina Cloud, Lucy Lastic, Mick Sturbs or Hellen Bach, for the purpose) with an often surrealistic bent. One memorable occasion involved Wogan reading out an email from someone using the name "Tess Tickles", without realising what the name was referring to, prompting Paul Walters' standard reply in such situations – "I only print 'em!" As his radio show was considered to attract older listeners, Wogan jokingly refers to his fans as "TOGs", standing for Terry's Old Geezers or Terry's Old Gals, whilst "TYGs" are Terry's Young Geezers/Gals who he jokes are forced to listen to him because of their parents' choice of radio station. Wogan is referred to as The Togmeister on his own programme by himself and members of his production team, and he refers to the podcast of his show as a 'togcast' in keeping with the acronyms described above. There were also running jokes involving Wogan's newsreader colleagues Alan Dedicoat (nicknamed 'Deadly' after the spoonerism 'Deadly Alancoat'), Fran Godfrey and John Marsh (nicknamed 'Boggy'). Marsh once told Wogan on air that his wife was called Janet, and a series of "Janet and John" stories followed, read by Wogan during the breakfast show. These are a pastiche of children's learn-to-read stories but are littered with humorous sexual double-entendres which often led to Wogan and Marsh breaking into uncontrollable laughter. Five CDs, the first with fourteen stories, the second with sixteen, the third with eighteen (two never broadcast), the fourth with eighteen and the fifth with nineteen (one never broadcast), have been sold by listeners in aid of Children in Need, and have raised an enormous amount for the campaign (to date: over £3 million from all sales of related TOG/TYG products). A long-running campaign by Wogan criticising the British government for levying VAT on these CDs eventually led to a government rebate of £200,000. Another feature of the programme was Wogan's exchanges with “the Totty from Splotty “ – Lynn Bowles, the Welsh traffic reporter from Splott, Cardiff – which often involved reading limericks from listeners cut short after 1 or 2 lines as risqué innuendo in the later lines was telegraphed. Through his show Wogan is also widely credited with launching the career of singer Katie Melua after he repeatedly played her debut single, "The Closest Thing to Crazy", in late 2003. When she performed on Children in Need in 2005, Wogan jokingly said to Melua, "You owe it all to me, and maybe a little to your own talent". He has, however, made no secret that the credit for discovering her lies with his longtime producer, Paul Walters. In 2005, it was reported that his breakfast show Wake Up to Wogan attracted an audience of eight million. According to figures leaked to British newspapers in April 2006, Wogan was the highest paid BBC radio presenter at that time, with an £800,000 a year salary. In an interview with Britain's Hello magazine in its 30 May 2006 issue, Wogan confirmed this, saying, "The amount they said was true and I don't give a monkey's about people knowing it. Nor do I feel guilty. If you do the maths, factoring in my eight million listeners, I cost the BBC about 2p a fortnight. I think I'm cheap at the price". On 23 May 2005, Wogan broke strike picket lines to present his show. The strike by BBC staff was a protest over announced job cuts. Reportedly, he gave them a smile and wished them all well. He explained on air that the reason for doing so was that he is contracted to host Wake up to Wogan and hence is not directly employed by the BBC, and so could not legally strike with their employees. Wogan was forced off air on 16 February 2007 when steam from a nearby gym set off fire alarms. For 15 minutes an emergency tape played non-stop music. On returning, Wogan read out several light hearted comments from listeners saying that they thought he had died with his sudden disappearance and the playing of such sentimental music. On 7 September 2009, Wogan confirmed to his listeners that he would be leaving the breakfast show at the end of the year with Chris Evans taking over. The Times published an ode to Terry: "Stop all the clocks, cut off the telephone. Terry Wogan is abandoning his microphone", and novelist Allison Pearson commented: "Heard the one about the Irishman who reminded the British of what they could be at their best? His name was Terry Wogan." Wogan presented his final Radio 2 breakfast show on 18 December 2009. It was announced that Wogan would return to Radio 2 from 14 February 2010 to host a live weekly two-hour Sunday show on Radio 2, featuring live musical performance and guests, between 11.00 am and 1.00 pm. The show, titled Weekend Wogan was hosted in front of a live audience in the Radio Theatre at Broadcasting House until the 4th series where he returned to the studio. Some 30,000 people applied for 300 tickets to be in the audience. Wogan's first guests on his new show were the actor Sir Ian McKellen and jazz singers Norah Jones and Jamie Cullum. The programme also featured a house band (Elio Pace). In 1980, the BBC's charity appeal for children was first broadcast as a telethon called Children in Need, with Wogan presenting alongside Sue Lawley and Esther Rantzen. Wogan has been the presenter of this annual event ever since. He has campaigned extensively for the charity and often involves himself via auctions on his radio show, or more directly by taking part in well-publicised sponsored activities. He is reported to be the only celebrity paid for his participation in Children in Need, having received a fee every year since 1980 (£9,065 in 2005). Wogan, however, has stated that he would "quite happily do it for nothing" and that he "never asked for a fee". The BBC stated that the fee had "never been negotiated". Wogan's fee has been paid from BBC resources and not from the Children in Need charity fund. There is no record, however, of Wogan ever having repaid his fee from previous years. His first and only appearance on the panel comedy show QI was in the 2008 episode for Children in Need, 'Families'. In 2008, Wogan and Aled Jones released a single "Little Drummer Boy/Peace on Earth" which got to number three in the UK music charts. The money raised went to BBC Children in Need. The two recorded a second Christmas single "Silver Bells" in 2009 which was also in aid of BBC Children in Need. In October 2013, Wogan became the latest television personality to admit he had heard rumours of the child sexual abuse by the late Sir Jimmy Savile. In 1971 and from 1974 until 1977, Wogan provided the BBC's radio commentary for the Eurovision Song Contest. He became better known for his television commentary, which he handled first in 1973 and then again in 1978. From 1980 until 2008, he provided the BBC's television commentary every year and became famous for his sardonic and highly cynical comments. He also co-hosted the contest with Ulrika Jonsson in 1998, in Birmingham. From 1977 until 1996 Wogan hosted the UK selection heat each year, returning to the job in 1998 and again from 2003 until 2008. In 1973, 1975 and every year from 1977 until 1984 and once more in 1994, Wogan also presented the UK Eurovision Song Contest Previews on BBC1. He remained until recently an advocate of the contest. He earned a reported £150,000 annually for his work with the contest. Wogan's commentating style, which often involved humour at the expense of others, caused some minor controversy: for example, when he referred to the hosts of the 2001 contest in Denmark, Søren Pilmark and Natasja Crone Back, as "Doctor Death and the Tooth Fairy". During the presentation of the Dutch televote in the Eurovision Song Contest 2006, Wogan called the Dutch televote presenter, Paul de Leeuw, an "eejit", as de Leeuw started to make ad lib comments, gave his mobile phone number and lengthened the Dutch results. Chris Tarrant later remarked that "Terry Wogan's commentary is why any sane person would choose to watch the Eurovision," referring to his well-known acerbity. During the 2007 BBC show Making Your Mind Up, in which the British public voted to decide their Eurovision entry, Terry Wogan announced, wrongly, that the runner-up Cyndi was the winner. The actual winner was the group Scooch and, according to the BBC, Terry Wogan had been provided with the correct result during the live show. His response to this on his radio show was quite simple, "It's not like anybody died or anything." He also stated that if they'd gone with Cyndi, we'd not have come last. In recent years, the Contest has become notorious for what is widely seen as an increase in political voting (an aspect of the voting which has been suspected for many years). In 2008, the UK's entry, Andy Abraham, came last, much to Wogan's disappointment. Wogan argued that Abraham "..gave, I think, the performance of his life with a song that certainly deserved far more points than it got when you look at the points that Spain got, that Bosnia-Herzegovina got – some really ridiculous songs." Unknown to the majority of television viewers across Europe, Wogan is well-known to many veteran broadcasters across the continent, being seen as a Eurovision Song Contest institution. Indeed, at the 2008 contest he was acknowledged by both hosts, and welcomed personally by name to the show (alongside only two other individuals from the 43 participating broadcasting nations: France's Jean-Paul Gaultier and Finland's 2007 Contest host Jaana Pelkonen). After hinting of his intentions on live television during the closing credits of the 2008 contest, on 11 August 2008, Wogan said in an interview with the Radio Times magazine that he was 'very doubtful' about presenting the Eurovision Song Contest for the United Kingdom again, claiming it was "predictable" and "... no longer a music contest". On 5 December 2008, Wogan officially stepped down from the role after 35 years. Graham Norton succeeded Wogan as BBC commentator for the 2009 contest. Norton said during the opening comments "I know, I miss Terry too." In November 2014, Wogan reviewed Norton's autobiography for The Irish Times. Describing his attitude towards the contest, he writes that he saw it as a "sometimes foolish farce". However, he hints that the 2014 winner, Austrian drag act Conchita Wurst, was a "freakshow". Wogan's first foray into TV interviewing was with "What's on Wogan? ", which ran for one series in 1980 on BBC1, primarily on early Saturday evenings. In 1981, he had a chance to host a one-off chat show, Saturday Live. Among his guests on this show were Larry Hagman, promoting S.O.B., and Frank Hall. Hagman was at the height of his fame, which gave the show a high profile. Soon after Wogan was given his own chat show, Chevy Chase, a nervous Anne Bancroft who was so petrified she gave monosyllabic answers and counted to ten before descending the entrance steps to the studio, Ronnie Barker announcing his retirement on the show, and David Icke claiming to be the "Son of God", to whom Wogan famously stated: "They're not laughing with you, they're laughing at you." In 1989, controversy was generated after the BBC banned an interview with Simon Hayward, a former Captain of the Life Guards, just hours before he was due to appear on the Wogan show. Hayward insisted that he was innocent of drug smuggling offences. The decision was taken by the then BBC1 Controller Jonathan Powell after protests from several MPs. However, the BBC was accused of censorship and Conservative MP John Gorst described the decision to ban Hayward from Wogan as "outrageous". In 1992, Wogan was released from his talk-show contract after pressure from the BBC. He claims that the BBC also wanted his scheduling slot for the ill-fated soap Eldorado. After Eldorado took over the 7pm slot, Wogan briefly hosted a new weekly chat strand "Terry Wogan's Friday Night" in 1993, but this series was not recommissioned. In 2006, Wogan presented Wogan Now and Then, a show where he interviewed guests from his old chat show as well as new guests, and for which he reportedly earned £30,000 per episode. In 2015, BBC Two launched a new compilation series, Wogan: the Best Of, which featured selected interview segments and music performances from Wogan's past chat series, linked by new introductions from Wogan. In 1981, Wogan set the world record for the longest successful golf putt ever televised, which was 33 yards at the Gleneagles golf course in a pro-celebrity TV programme on the BBC. Wogan narrated the 1987 BBC television series Stoppit and Tidyup. Wogan appeared on Friday Night with Jonathan Ross four times, between 2004 and 2009. In an appearance on the BBC programme Top Gear, Wogan managed to become one of the slowest people to go around the test track as the "Star in a Reasonably-Priced Car", a Suzuki Liana. His time of 2:04 was only faster than Richard Whiteley, whose time was 2:06. In 2010, Wogan made a cameo appearance in the second series of Being Human. In 2010, Wogan also guest-hosted the fourth episode of the 24th series of Never Mind the Buzzcocks. The following year, Wogan hosted Wogan on Wodehouse for BBC Two. On 21 September 2013, Wogan appeared as a panellist on ITV game show Through the Keyhole. In November 2013, he participated in a celebrity edition of the BBC One game show Pointless, with celebrities including Bobby Ball and Esther Rantzen, in aid of Children in Need. On 31 March 2014, Wogan was a guest reporter on Bang Goes the Theory, on which he discussed old-age dementia. During the week of 12 to 16 May 2014, Wogan appeared on the Channel 4 game show Draw It!. 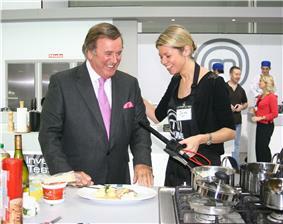 Terry Wogan at MasterChef Live, London, 2009. Wogan has hosted the annual "The Oldie of the Year Awards" event for The Oldie magazine, from 2003 to 2014, and was involved in a dispute with the magazine's publishers in June 2014 after Richard Ingrams, aged 76, resigned after 22 years as editor of the publication. Sources close to the magazine stated: "It comes as absolutely no surprise to me that Wogan has withdrawn his support as a result of Richard's resignation", which occurred after the magazine's publisher, James Pembroke, demanded Ingram's presence at a disciplinary hearing. Wogan was the subject of This Is Your Life in 1978 when he was surprised by Eamonn Andrews at Broadcasting House. In the first ‘hit’ of its kind, Eamonn interrupted Terry’s BBC Radio 2 morning show to surprise him live on air. Wogan was appointed an Honorary Officer of the Order of the British Empire (OBE) in 1997 and elevated to an Honorary Knight Commander of the same order (KBE) in the Queen's Birthday Honours in 2005. After asserting his right to British citizenship (he retains his Irish citizenship) that year, the knighthood was made substantive on 11 October 2005, allowing him to use the style "Sir". On 29 May 2007 he was made a Deputy Lieutenant of Buckinghamshire. On 15 June 2007, Wogan's home City of Limerick honoured him with the Freedom of the City at a ceremony in Limerick's Civic Hall. The Freedom of Limerick honour dates from medieval times and the City received it charter from Prince John in 1197. Because of his long absence from the city as well as some well remembered, less than flattering remarks about the city in a 1980 interview, the local press carried out a vox pop which resulted in unanimous support for the award. He has since acknowledged the strength of character of the local population who "never give up ... never say die and ... are never beaten." "Limerick never left me" he is quoted as saying and "whatever it is, my identity is Limerick." In 2004, he received an Honorary D.Litt. degree from the University of Limerick as well as a special lifetime achievement award from his native city. Wogan was inducted into the Radio Academy Hall of Fame at a gala dinner held in his honour on 10 December 2009. Wogan received an Honorary LL.D. degree from Leicester University in 2010. Wogan was announced as the Ultimate Icon of Radio 2 \ commemorating the station's 40th birthday. The shortlist of sixteen candidates had been published on the BBC Radio 2 website and the winner was announced live on Radio 2 during Family Favourites with Michael Aspel on 30 September 2007. He praised his fellow nominees, The Beatles, Diana, Princess of Wales and Nelson Mandela during his acceptance speech which was broadcast live on BBC Radio 2, and he chose Nat King Cole's Stardust as his Iconic Song of the last 40 years, which Wogan had chosen twice before as his favourite record on BBC Radio 4's Desert Island Discs. As a well-known public figure, Wogan has been referred to on television, in novels, in films, and in music. In the novelisation of the television series Yes, Prime Minister, for example, the fictional Prime Minister, Jim Hacker, discusses having an interview with Wogan. To his suggestion that Wogan be given a knighthood to ensure that the interview would go well, his Private Secretary replied "Sir Terence Wogan? I hardly think so, Prime Minister." Wogan is referred to in the song "The Dark of the Matinée" by Scottish indie rockers Franz Ferdinand. The relevant line goes "So I'm on BBC2 now telling Terry Wogan how I made it and / What I made isn't clear now, but his deference is and his laughter is / My words and smile are so easy now...Yes it's easy now. Yes it's easy now!". When Franz Ferdinand played a show in Limerick in 2009, one Irish reviewer wondered if the band had made the connection between lyric and city. The British 2 Tone band Madness recorded a jingle for Wogan's show in 1982, which is included in the box set The Business – the Definitive Singles Collection. Katherine (born 1972) ex-actress and designer, married to the Hon. Henry Cripps, eldest son of Michael Cripps, 5th Baron Parmoor. The couple run five gastro pubs in Berkshire. In April 2013, Wogan was invited by the family of Baroness Thatcher to attend her funeral. Wogan was brought up a Roman Catholic and educated by the Jesuits and the Redemptorist. Since then, in an interview with Gay Byrne on the RTE religious programme The Meaning of Life and in Irish newspaper The Sunday Independent, he has stated that he is an atheist and that he respects those who have "the gift of faith." ^ Bob Chaundy (9 March 2007). "Faces of the week". BBC News Profiles Unit. Retrieved 9 September 2009. ^ "BBC NEWS – Entertainment – Radio's Wogan becomes Sir Terry". ^ Mason, Marilyn (1 August 2004). "Suffer Little Children". New Internationalist. Retrieved 2 June 2007. ^ Sheridan, Anne (8 September 2006). "Wogan's message to city". Limerick Leader. Retrieved 24 May 2007. ^ "Terry Wogan: You Ask The Questions". The Independent (London, UK). 24 June 2004. Retrieved 13 March 2010. ^ Ingoldsby, Padraig. "List of Old Belvederians who have been honoured as Knights of the realm". ^ a b "Terry's Top Ten Triumphs!". UKTV Gold. Retrieved 19 May 2007. ^ BBC Genome. BBC http://genome.ch.bbc.co.uk/. Retrieved 13 August 2015. ^ "VATwise" (PDF). 2007. Retrieved 1 October 2007. ^ Davies, Hugh (19 April 2006). "Wogan is number one in BBC radio rich list". The Daily Telegraph (London, UK). Retrieved 24 May 2007. ^ O'Carroll, Lisa, Deans, Jason, and Day, Julia (23 May 2005). "TV stars: why we crossed BBC picket line". ^ "Fire alarm forces Wogan off air". BBC News. 16 February 2007. Retrieved 2 June 2007. ^ "Sir Terry Wogan bids farewell to show". BBC News. 18 December 2009. Retrieved 18 December 2009. ^ "Sir Terry Wogan to launch brand new Sunday programme on Radio 2 in 2010". BBC Press Office. 16 October 2009. ^ Thomas, Liz (15 February 2010). "Terry Wogan hobbles back into action as he arrives for his new Radio 2 show on a walking stick". Daily Mail. Retrieved 22 February 2010. ^ Myall, Steve (5 March 2007). "Wogan is the only celeb paid for Children in Need". The Mail on Sunday. Retrieved 22 June 2007. ^ "Wogan charity fee defended by BBC". BBC News. 4 March 2007. Retrieved 2 June 2007. ^ Oslry, Richard (6 October 2013). "'"Terry Wogan: 'Talk about Jimmy Savile swept BBC. The Guardian. Retrieved 5 July 2014. ^ a b Neil, Beth; Damien Fletcher (3 June 2007). "Terry Wogan's Wonga". Daily Mirror. Retrieved 3 June 2007. ^ "'"Eurovision gaffe 'not technical. BBC News. 19 March 2007. Retrieved 15 May 2007. ^ "Norton is new Wogan on Eurovision". BBC News. 5 December 2008. Retrieved 15 May 2008. ^ Wogan, Terry (1 November 2014). "Better the devil you know: The Life and Loves of a He-Devil by Graham Norton: A Memoir". The Irish Times. ^ Muldoon, Padraig (1 November 2014). "Ex UK Commentator: I’ve Always Seen The Eurovision As A Sometimes Foolish Farce, But Not As A Freakshow". wiwibloggs. ^ a b Burrell, Ian (23 January 2006). "Terry Wogan: Welcome to his world". ^ "Hayward banned from Wogan show". The Herald (Glasgow). 14 September 1989. Retrieved 22 February 2014. ^ Jones, Dan (4 June 2004). "Guardian Unlimited Sport Small Talk". The Guardian (London). Retrieved 2 June 2007. ^ "BBC One - Pointless Celebrities, Children in Need Special". Bbc.co.uk. 15 November 2013. Retrieved 7 June 2014. ^ "Draw it! on Channel 4 at 4:30pm May 12th, 2014". Digiguide.tv. 12 May 2014. Retrieved 7 June 2014. ^ William Turvill (3 June 2014). "Wogan withdraws support from Oldie awards lunch: The treacle tart wouldn't be the same without Richard Ingrams". Press Gazette. Progressive Media International. Retrieved 13 June 2014. ^ The London Gazette: (Supplement) no. 57855. p. 26. 31 December 2005. Retrieved 14 January 2008. ^ The London Gazette: no. 58839. p. 7666. 29 May 2007. Retrieved 14 January 2008. ^ "Wogan backs 'lost city' Leicester's City of Culture bid". BBC News. 6 September 2013. ^ "Honorary Degree for Sir Terry Wogan: Media Operational Note". Retrieved 6 September 2013. ^ Singh, Anita (9 December 2008). "Fire at home of BBC presenter Terry Wogan". The Telegraph (London, UK). Retrieved 9 December 2008. ^ "Margaret Thatcher funeral: Jeremy Clarkson, Terry Wogan, ex-PMs invited". Digital Spy. 11 April 2013. Retrieved 1 May 2013. ^ Interview with Wogan, rte.ie; accessed 8 May 2014. ^ Larissa Nolan, 'I Have Never Believed in God: Wogan', The Sunday Independent (Ireland), 8 May 2005.